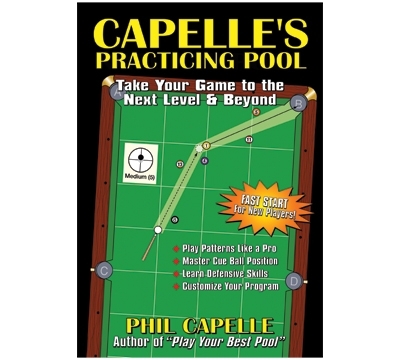 PP20 – Capelle's "Practicing Pool"
Phil Capelle's latest book, "Practicing Pool", offers the serious student the most complete and useful practice guide on the market today. The first chapter teaches you how to become a great student. Other chapters include exercises for new players, fundamentals, position play, patterns, safeties and much more. An extensive section on Natural Aiming will help you zero in on the pocket. You'll also learn some fun practice games, how to practice with a partner, and how to structure a practice session. The E-Z Ball Placement system and the spiral-binding make setting up the shots a breeze. Over 200 Illustrations; 292 pages.